A new month, so a new Stitch Along. I want to do something a little different this month. Instead of giving you a list of materials to select for week one, we are going to jump right into the stitching! Beyond Basic Digitizing is a class on manual digitizing for home embroidery machine users. Most new to embroidery users are satisfied with the Auto Digitizing part of the software. As your expertise grows you will find manual digitizing gives you so many more options and looks so much better when it stitches out. I am posting a couple of photos to let you see how much more you can do with your software. Come and join us for class – you will love it! I love making landscapes, especially landscapes that have some form of moving water – waves coming into shore, waterfalls, streams, rapids and ripples. There is an art to making water in motion, and in this class, you will learn many techniques that will give your water scene that realism that makes your scene come alive! Deciding what to do with my stitch along project at this point was probably the hardest part of the whole challenge for me, but I decided I might make this one into a cushion - after all, I could do with some fresh covers! My finished block ended up a little over 15" but I figured that was fine for now, I'll use the excess for straightening up later once I get an idea of where I'll be cutting. Over the five lessons in More Abstract Art for Quiltermakers, we’re going to explore more aspects of abstract art. In my first Abstract art for Quiltmakers class we looked at the lives and work, ideas and processes, of female abstract artists, artists often overlooked. 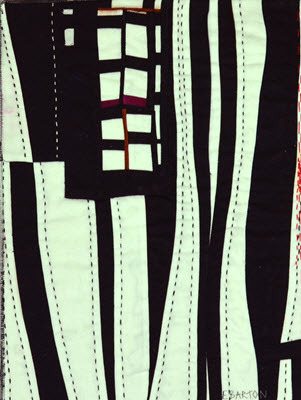 In this Abstract Art for Quiltmakers Part 2, I’d like to focus on the best known and most influential abstract artists, regardless of whether they are male or female, though (in the way of things!) most of them will be male. 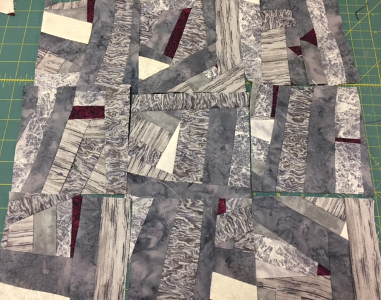 Do check out what Jennifer and Susan have been up to in the March Stitch Along Gallery, but more importantly, how have you been getting on with this challenge? I'd love to see!